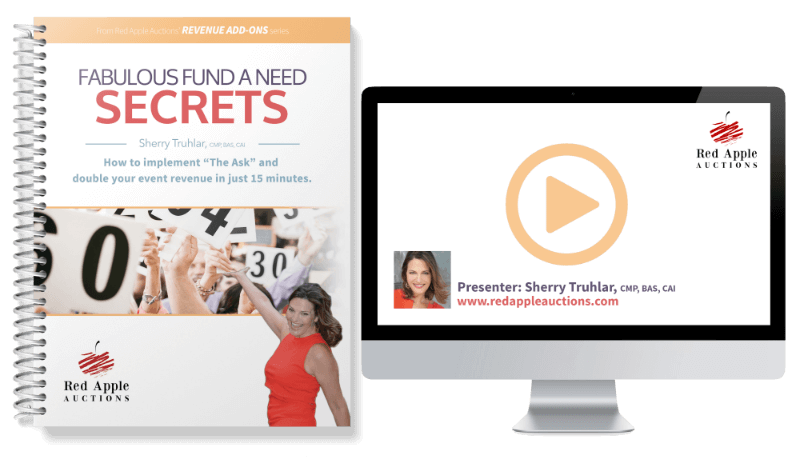 How to double your benefit auction revenues in 15 minutes! Fund a Needs are called different names – Raise the Paddle, Emotional Appeals, Mission Moments – but the gist is the same: Ask guests to raise their bid paddle to make a straight donation to your cause. This element in your gala will often generate more than the live auction in its entirety. Can you imagine nearly every one of your guests raising their hand to make a contribution to your cause? Your donor base SWELLS with new contributions from new donors … and it all happens in just 15 minutes. If you’re not doing a Fund a Need, you should be. And if you’ve been holding one, did you know that the Fund a Need has been changing dramatically? Techniques have been introduced to make raising more money even easier. Here’s the scary fact: Well-managed appeals generate thousands of dollars. Poorly managed ones generate pennies. It’s a LOST OPPORTUNITY if you don’t run this properly. 94% increase: A Kentucky school was OK with the money raised ($25,600 with an average gift of $39) but felt they were missing something. Tweaking the Fund a Need generated $49,670 with an average gift of $90 a year later. Same crowd – different technique. A new level: A Florida nonprofit hit a new high of over $130,000 using new techniques. Boost of $36,000: A New York nonprofit adjusted an already successful appeal to raise an additional $36k, moving from $250,000 to $286,500. Same crowd – different technique. 94% increase: A D.C. nonprofit jumped from $26,000 to $50,400 in one year. Same crowd – different technique. First-year effort: A Maryland school that raised over $70,000 in a first time Fund a Need. My formula for writing a compelling “ask.” Follow this step-by-step to eloquently deliver an authentic presentation that inspires donors. Insider language of your gala guest: The SPECIFIC PHRASES that flip on your guests’ “must donate” switch. These are psychological triggers that entice guests to raise their paddle RIGHT THEN. Trends in Fund a Needs: Are you STILL USING A CLIENT SPEAKER to introduce the cause? You’ll learn why this is can be a step in the wrong direction, and what often is better, instead. What Fund a Need type is best for your cause? Learn how to determine if your appeal should ask guests to donate a set amount of money (like $25), offer tiered levels of giving, or cards on a table. Learn when to do each because NOT EVERY APPEAL SHOULD BE TIERED. WHERE TO START your Fund a Need. What’s ridiculous and what’s right on the money when it comes to setting it up. 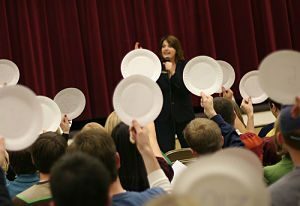 Perfect Placing: When and how to introduce the Fund a Need for perfect placing, regardless of your event style (sit-down dinner versus food stations). BEST PRACTICES in affordable videos. Most of the ones you’ll see are NOT professionally made, so your cash outlay is nominal. And knowing how to structure it cuts down on production time. How to LEVERAGE UNEXPECTED GENEROUS DONATIONS that often “scare off” smaller donors from donating. Learn how to use it to INPSIRE GIVING, instead. How to sprinkle your Fund a Need mission throughout your gala so guests are saturated with the cause and your need. The video of the live webinar (90+ minutes). A Companion Guide with full transcripts from 6 of my well-received Fund a Needs. You’ll literally read “what I said” on stage so you can model it. Messaging videos from real events. Hidden on a private section of my website, I’ve posted videos that were shown at actual Fund A Needs across the country. The Companion Guide has your weblink and password, enabling you to view those videos and see what other nonprofits have produced to be played immediately prior to the Fund a Need. This webinar is for you if you’re involved in running a fundraising event – even if no live or silent auction is part of the event. If your event will (1) have people, and (2) you have a sound system to direct guests’ attention, you can do a Fund a Need. 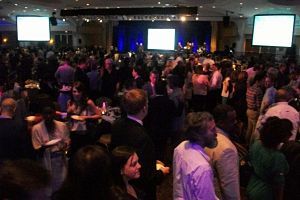 Even casual college alumni events and adult birthday parties have spontaneously organized Fund a Needs and raised hundreds to thousands of dollars. What you might not know about your presenter. Benefit auctioneer Sherry Truhlar works several galas each year in which the ONLY fundraising activity is the Fund a Need, with no live or silent auction component. As a paid presenter (and not just an auctioneer), she has special insight into the mechanics of what makes this element of a gala succeed. I did your Fabulous Fund a Need course last year, and we raised an additional $67,000 the first time we ever tried it!!!! Genius! That amount was on top of an already successful live auction. We ran our regular live and tacked the Fund a Need on to it. UPDATE September 22, 2014: ‎Year #1 Fund a Need we raised $67,000. Now in Year #2 we raised $93,500. All it took was ten minutes of our time! This year we funded cancer ‎equipment. Donors were so moved to give, some even raised their paddles with tears in their eyes. Sherry, you have a fool-proof system!!! The Fabulous Fund A Need was very helpful, as we finally added a Fund a Need to our auction in November 2015. We had kicked around the idea for years and never came up with a compelling ask presentation, but with the tips from your webinar, we added it to the event and raised $60,000. Your tips helped us create a compelling video, find the right person (a nun!) to deliver the ask, come up with the right name (Fund the Mission), craft a compelling script and work with our auctioneer to make it work. I’ve seen plenty of these fall flat, and plenty of successes. Our first fund a need exceeded our expectations, and we are already planning how to do it again in 2016. Thank you for creating such fun and informative webinars. I especially enjoy the examples and real life photos and examples (good and bad). You are my go-to auction resource, and I refer many of my peers to your site and webinars. Thank you! I am so excited to report that our first Fund A Need conducted at our 26th annual fundraiser was a huge success! Thanks to Sherry’s “Fabulous Fund a Need Secrets,” we raised an additional $12,200 in just 10 minutes! To be honest, I was skeptical about doing this appeal; however, I needed to make it work so I used every tip in your book and modified your sample scripts for our purposes. The fact that we conducted the appeal directly after a dynamic speaker clinched the deal! I would recommend this book to any nonprofit wishing to try this for the first time. Our auction has improved immensely from the training workshop I attended in Chicago, the workbooks we have purchased (Cool Class Projects, Fabulous Fund a Need Secrets, Rockin’ Raffles for Auctions, and Simple Auction Checkout), the webinars we’ve attended and your great website. Thank you for all that you do! We held our first Fund a Need using your suggestions on May 29 and it blew us out of the water! We learned a few things we might not do next time but I thought I would give you an update. Our goal was to raise $40,000 and we actually raised $245,000 in about 10 minutes. The donors were a little surprised (we haven’t ever done fundraising at this particular event), but we gave them a bit of a heads up. We raised the regular $22k we usually do via ticket sales and sponsors, but the auction was a stand-alone success. I work for a small independent school in Montana and we made 2 big changes to our event last year: 1) We moved from a spring gala style auction/live auction to a fall family friendly event and 2) We used your Fabulous Fund a Need Secrets to raise money for technology and professional development and followed your book’s every detail. Our goal was $20k (high for us) and we raised $35k! It was a huge success and I am bringing it out again this year for our Fall Family Round Up. I also shared the book with a development director of another school who had never asked for a raise the paddle at an event before and was terrified it would bomb. She thanked me and said they surpassed their goals as well. I’ll let you know how we do this year with our biggest ever goal. We followed your format and raised $10,000 in ten minutes through a direct appeal. Normally, that’s about how much we net from our entire auction. The format made it really easy and natural to do the ask. Thank you! This past weekend I put on my very first gala fundraiser. When I was hired 20 months ago, it was clear that this event was going to be critical to our fundraising efforts. I had never done anything like this before and neither had my organization. So I needed to learn a lot in a short time, with a very limited (independent non-profit senior center) budget. I found Red Apple Auctions blog to be a wonderful resource. I purchased three webinar books – Fund A Need, Rockin’ Raffles, and Simple Registration – and they made a huge difference! I got lots of compliments from my 30-person volunteer committee about how organized and knowledgeable I was. I frequently cited Sherry’s recommendations when one of my committee or Board members had an idea that just wouldn’t work. Everyone had a fabulous time at the gala and things ran very smoothly. Bottom line – if everyone pays their pledges – my first time event will net over $130,000! I am amazed by these results and grateful that I found your website! I’m happy to share pictures and testimonial if you would like. 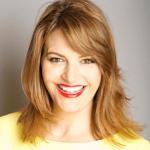 Your Fabulous Fund-A-Need Secrets guide proved invaluable as it gave us additional NEW ideas for how to promote the fund-a-need (and the school has been doing auctions for 16 years), and tips for how to get people to bid more. The six different transcripts showing the actual language used by the auctioneer for six different auctions was probably the most useful part as it showcased different techniques for motivating people at the different levels. So glad I participated in the Fund a Need Webinar! On our very first attempt, we were able to raise over $7,000 for new equipment. With more lead time in the coming year, we are looking forward to an even bigger result. The DVD and workbook were super because I had something tangible to share with my committee members and the staff who produced our video. The information you provided in your Fund a Need Webinar had a wonderful impact on our auction ask. I took the tools you provided and shared them with my executive staff. Our Executive Director did a bit of pre-work (per your suggestion) and had $13,000 committed within 15 minutes. That was more than half our goal for monetary contributions for the evening, and we were weeks before the event even happened. When it was all said and done, we raised over $15,000 more than we had budgeted using your tips, and we raised double what we raised in the previous year. We used your marketing examples, scripts and tally sheets to help pull everything together. The webinar was money well invested and I highly recommend it to anyone doing a fund a need appeal. I implemented tips from the webinar at our wine event in June, and our paddle raise increased from $9,000 to $23,000. So YES, the webinar was worth it! Focusing on this piece of the gala with my committee paid off! I will be implementing what I learned in the webinar at another event scheduled for October. The paddle raise at the October event has traditionally done quite well, so it will be interesting to see how much BETTER we can do with some of these minor tweaks. Great course, as always! Awesome examples and very clear cut! I haven’t had a chance to implement the ideas from the webinar yet (our event is a few months away), but I’m definitely adding a number of these strategies. Can’t wait to put them in! The webinar was very helpful. We’re a first time auction and taking several months to plan our inaugural event. You explained the concept in such a way that even those in the group who were unfamiliar with Fund a Needs now have a clear understanding of how to set it up so it works best.